For some reasons, year 2012 turned out to be my best year in golf. I’ve been more passionate about my golf game more than ever, and in result, I posted my lowest ever score, and had been playing some of my best stretch of golf during the year. If I looked back this may be attributed by two factors: first, my current workplace, is a golf-craze environment. Winning or losing in office golf tournament can be a popular topic in the board room coming Monday morning. As a competitive person this drive me to hone my golf game to rain ahead of my colleagues’ game an fair share of prizes and prides (ok, a little bit of money then). of my team member, Richard, to take up golf. And boy, how he was hooked into it. He is very passionate about it and whenever time (and wife) allows, he will go to the range or to golf course. His commitment to the game apparently also drive me to be more serious with my golf game. I came to range more often than in previous years (mostly came with him), and as i gave him more tips about practicing golf, I myself learned a lot from it, and explored further to hone my golf skills. And of course, my competitive spirit also played a part here–to ensure he will not get near me. Ha! I played 45 rounds this year. This is probably the highest number of rounds I ever played in a year! The average score of these 45 rounds are 88. This equates to 16 over par. This consist of 4% birdies, 30% pars, 42% bogies and 24% double bogies or worse. I made only 1 eagle in 2012. Clearly, I need to reduce those double bogies or worse scores! My USGA handicap as per today is 9.8. But I rather not calling myself a single handicapper. I’m more to 12-14 handicap for official tournament. And that’s my aim for 2013: real single handicap golfer! 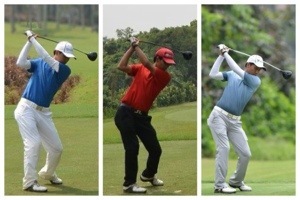 My best round in the year came on 2 September 2012, in Halim 1 golf course where I posted 78. This was also the first time ever I broke 80. And still the only time I did it. I actually had great chance to do it again when I played in New Kuta Golf Course, on 21 November 2012. Playing the last hole with 7+ over par, I only need par to play 79. But then I realized why so many major triumph failed on last hole: I choked and made double bogey. LOL. My ‘fairway hits’ is still my strength, according to my golf stats , with 69.5% of my drive was in fairway. I hit in average 226 meters with my Driver. My Green-in-Regulation (GIRs) is at 33.3%. Not too bad, but surely an area I can improve with my irons/approach shots. Putting, I admit, is still the weakest part of my game. My average putts per hole is 1.92, but my average putts per GIR was 2.12. It means I made more 3 putts than I should have. I did change, however, my putter two times this year. I bought myself Heavy Putter Lightweight model in mid 2012. It started its career in spectacular fashion. Helped me to drain most of my makeable putts in 4-5 first rounds, but only to allow the confidence and alignment issues crept in and made me to buy new putter: Scotty Cameron Monterey 1.5 — with the same effect. Now i use the two putters interchangeably according to the state of my putting game. Not only changing my putters, I also changed many of my golf gears this year, this is perhaps influenced by my friend Richard, whose passion to shop for his golf gears and accessories easily match his passion to practice! But for my case it’s an overdue replacements: I used my Callaway X20 Tour Irons for almost 7 years before I replaced them with Yamaha V Forged 2012. I also replaced my 5-years-old TaylorMade Burner Draw driver with Callaway Razr Fit Driver. And lastly, I replaced my 8 years old Cleveland Launcher FW with TaylorMade RBZ fairway woods. All I reckon as good buys and improved my game. If you notice, there is one thing that help me to keep my scores, stats and handicap: it is the excellent GolfShot GPS apps from ShotZoom. This app is the primary reason why i bought iPhone this year (serious! ), and it worths every penny. Highly recommended for those who are serious with their golf game! That’s all, so here is for better golf game in 2013: single handicap and more round below 80s! Amen! Previous Post Like a Kid in Candy (Lego) Store! Nice to hear all about your golf game. If you want to lower that handicap, you need to work on your putting. It’s great that you’ve analyzed your game and see that putting is the weakest part. If you work really hard on your putting fundamentals (grip, alignment, posture, stroke) and make putting the strongest part of your game, I have no doubt you can lower your handicap to below a 5 by the end of 2013. Happy New Year!